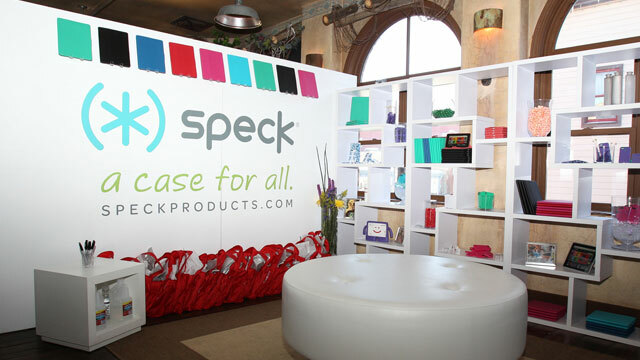 Speck hit Park City, Utah for the 2013 Sundance Film Festival as a gifting partner in the Variety Studios. In addition to interviewing each celebrity about what inspires them, Speck also set up a fun, sleek, well-lit space (with a candy shop theme!) where celebrities could first grab a case of their choice post-interview and, then, sign one of our iPad cases for charity (while snacking on some delicious, colorful candy!) Celebs were prompted to sign or doodle on FitFolios that would then be auctioned off on our Speck eBay store- all proceeds going to the Children’s Miracle Network! Celebs who participated included Daniel Radcliffe (who was one of our favorites! ), James Franco, Michael C. Hall, Jane Lynch, Octavia Spencer (who had amazing shoes), Toni Collette, Naomi Watts, Tony Danza, Shia LaBeouf, Keri Russell, and Allison Brie. Photos of celebrities signing cases and interacting with Speck were live-Tweeted and shared on Instagram and Pinterest. Many of these shots, with the help of our awesome PR team, were picked up in inTouch Weekly, Life&Style magazine, and more. Speck had a great time at Sundance and can’t wait to go back next year!